Central to the agenda of the New Left in the early to mid-1960s was the exposure of the lack of decisive de-Nazification and the survival of Nazism within West German society, particularly in the establishment. Until the year 1967, or more precisely until the Six-Day War, the German Left had been essentially pro-Israel. Then some voices in the ‘New Left’ spoke up, wanting to see the conflict in the Middle East as a particularly exemplary version of a world wide conflict between ‘imperialism’ and ‘national liberation movements’. The radical underground paper Agit883 began propagating the war against Israel on the side of El Fatah. Dieter Kunzelmann, a prominent figure in the radical left, called on the German Left to get rid of its ‘Judenknax’ (‘Jew-complex’). The ongoing conflict in the Middle East became an ersatz for the Vietnam war and for the increasingly failing guerilla wars in Latin America, which were at the time losing mobilising forces. Michael Landmann’s book, first published in 1971, was an urgent intervention to reverse this process, to remind the New Left of its enlightening potential and responsibility. The book consists of two main texts, the first one being Das Israelpseudos der Pseudolinken, and the second Antwort an Isaac Deutscher. Landmann’s starting point is that after the indignation about the horrors of fascism began to die down and the times returned to ‘the sleep of acceptance’, it was the New Left that brought back a sensitivity towards injustice in the world. It put forward a reminder, according to Landmann, that politics was not only following its own laws of functionality, but was subordinate to moral considerations. It gave the campaign against the Vietnam war an audible voice. It unmasked false constraints, conventions and authorities. In contrast and in opposition to the bureaucratically deformed ‘real existing socialism’ of the Eastern block, it emphasised the utopian potential. In that sense, it was ‘more Blochist than Marxist’, as Landmann puts it. But perhaps, he says, it was this utopian element that, when confronted with reality, lead to the decline of the New Left. ‘Rarely has a movement gambled away so much capital so quickly’. He concedes that the New Left didn’t do it as a whole, and it did it for many reasons, and on many fronts. ‘But one of the main fronts where the change was decisive and revealed itself was the position towards Israel’. In Berlin, when members of the extra-parliamentary opposition dressed up as El Fatah-people, ‘the supposed demonstration became a funeral procession’ for the hope the New Left had initially embodied. The intended audience for Landmann’s book were those who stayed true to the emancipatory elements of the New Left, a ‘true left’ which he separates from the ‘pseudo-left’ in the title of the book. He sets out carefully to expose the falsehoods, inconsistencies, illusions and lies in the anti-Zionist shift that much of the Left was participating in at the time. Other authors were similarly critical, including Jean Améry, another anti-fascist critic of this shift, who depicted this demonisation of Israel as a new ‘respectable’ anti-Semitism in his 1969 essay Der ehrbare Antisemitismus. While the first text in the book catalogues various accusations raised by proponents of the New Left, the second text is a more direct reply to a particular text by Isaac Deutscher. Deutscher (1907-67) was a Trotskyist writer and journalist who came from an orthodox Jewish family background, and who is most well known for his biographies of Stalin and Trotsky. In 1967, his text Der israelisch-arabische Konflikt was published as a booklet in the series Voltaire Flugschriften in Berlin. The text was a small excerpt from his book The Non-Jewish Jew and Other Essays. 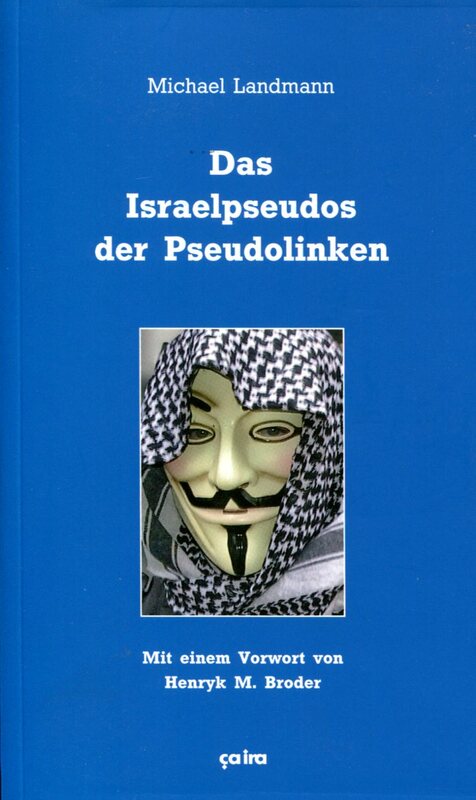 It is likely that Landmann only knew this particular text, as an incomplete edition of the whole book wouldn’t come out in German until 1977 (Die ungelöste Judenfrage – Zur Dialektik von Antisemitismus und Zionismus, Rotbuch 159, West Berlin), and a complete one only in 1988 (Der nichtjüdische Jude, Berlin 1988). The book version shows Deutscher as a lot more nuanced, his arguments more complex than the afterword by Eike Geisel and Mario Offenberg in the 1977 version would have us believe. While Deutscher does give ammunition to anti-Zionist arguments, it shouldn’t be overlooked that he himself explicitly acknowledges the tragic ‘terrible victory’ of Zionism over proletarian internationalism. It was the failure of the world revolution, but also the breakdown of European society and civilisation that made the Holocaust possible, and Israel necessary. It is the expression of this dilemma that Deutscher was acutely aware of, and that may be a reason that he doesn’t seem to be quoted much by contemporary enemies of Israel – he simply isn’t anti-Semitic enough. Deutscher died in 1967, so we don’t know what he would have made of the various uses of his texts, nor did he have a chance to reply to Michael Landmann. It appears that he did (against better judgement?) return to a more anti-Israel position following the Six-Day-war. In any case, Der israelisch-arabische Konflikt gives Landmann the opportunity to create a catalogue of a dozen key ‘arguments’ of the emerging anti-Israel camp in the New Left and dissect each one of them. The text examines the relationship between Israel and ‘imperialism’, Israel’s economic relations, its relations to the ‘progressive forces’ in Arab countries, the projections of (some of) the New Left equating the Middle Eastern conflict with the Vietnam war, the situation of orthodoxy and of socialism in Israel, the situation of the refugees, the occupied territories, and the assessment of the Six-Day War. Landmann’s arguments are directed at those in the New Left who could still be reached with rational discourse. As a supporter and sympathiser of the New Left, he is arguing that it risks turning into a ‘pseudo-left’ by appropriating the anti-Semitic essentials that lie in the demonisation of Israel, and by adopting conspiracy thinking, which results in fact-resistancy. The original texts from 1971 are amended with a short preface by Henryk M. Broder and a more extensive afterword by the editors, Jan Gerber and Anja Worm. Especially the latter is analysing the development of of anti-Zionism and anti-Semitism in the transition of the New Left to the radical left of later decades. Despite all the further shifts, as well as the left’s marginalisation in society, most of Landmann’s points unfortunately remain up to date.